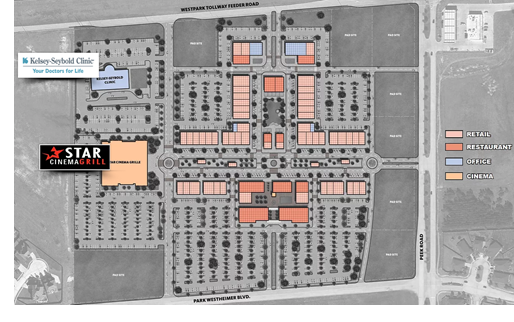 ​​ RICHMOND – District West, a roughly 100-acre mixed-use development, is currently being developed at the southwest corner of Westpark Tollway and Peek Rd. District West will contain around 500,000 sf retail, restaurant, office, health care and hospitality developments, and it'll cost around $500 million to develop. Phase one of District West will encompass 125,000 sf of the development's 500,000 sf, and construction should be completed in fall 2018. Just under 30 percent of the retail space has been preleased. District West's tenants include Star Cinema Grill, which will open a 47,000-sf, 12-theater location next spring, and Whiskey River, a 15,000-sf country dance hall and grill. Kelsey Seybold has already opened a 42,000-sf clinic in the development. ​Check out Houston Medical, Office, and Retail Market Research.